Ron's Rocks is a family business, which grew out of a hobby Ron Abbott developed in the 1980s. As an avid rockhound, Ron clambered over the countryside and delved into dark, wet places in search of nature's beauty - crystals. As well as having a geological interest in rocks and crystals, Ron also had an appreciation of the metaphysical properties of crystals. His enthusiasm and knowledge rubbed off on his family and those around him. 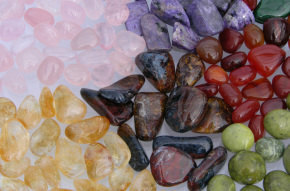 A love of rocks and crystals, and sharing it with others led to the creation of Ron's Rocks, which has been suppling retail shops in New Zealand since 1995. Sadly, Ron passed away unexpectedly in March 2010. We miss him dearly and nothing will replace the void he has left. But behind every great man is an even greater woman, and Ron's Rocks continues with Yvonne, supported by family and friends.